After hearing this read aloud followed by the release of the butterflies, I was inspired. I couldn’t stop thinking about the Legend, nor the image of all these butterflies. What was, in reality, around 100-200 butterflies, felt like thousands…..more. I wrote the song a couple of days later, I sat down in the morning and everything came flooding out. I recorded the song, to share with a few people, I received a very positive response to it. 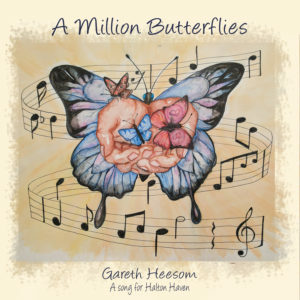 I had the idea of releasing the song for Halton Haven, with every penny that was due to me, going to the Haven. After approaching the Haven, and them being open to the idea, I set about getting it released. The song was released on Friday 27th October 2017, the same day I ended up moving house.